Someone who has gastroesophageal reflux disease (acid reflux) can experience heartburn. A painful burning occurs behind the breastbone and you may feel pain that goes up toward your throat. When you lie down or bend over, the pain will get worse. You may have the feeling that food is entering back into your mouth. These symptoms usually occur after you finish a large or spicy meal. Angina (when there is not enough blood flowing to your heart) can cause pain in your chest. Angina or a heart attack can cause tightness, squeezing, pressure, or dull pain in the middle of the chest. The pain can radiate to your neck, shoulders, or arms. Moreover, you may have trouble breathing, have an irregular heartbeat, or feel lightheaded, weak, or dizzy. Extreme stress or physical activity can lead to these symptoms. A high-arched foot can cause someone to have too much weight on the ball and heel of the foot when he or she is walking or standing. 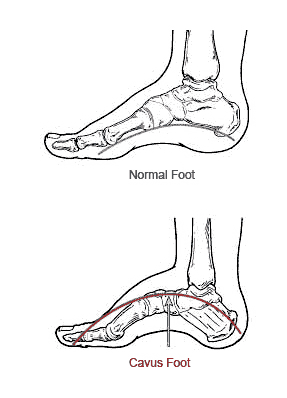 The heel of the foot is tilted inward and leads to an unstable foot. Therefore, a high-arched foot can increase the risk of getting an ankle sprain. One may experience symptoms, such as pain when standing or walking and on the ball, side or heel of the foot one may find calluses. Also, hammertoes (bent toes) or claw toes (toes clenched like a fist) may be present. In some cases, one may drag his or her foot when he or she takes a step due to the weak muscles of the foot and ankle. This is known as foot drop. Therefore, custom orthotics can be used to help treat a high-arched foot because it gives us stability and acts as a cushion for the foot.